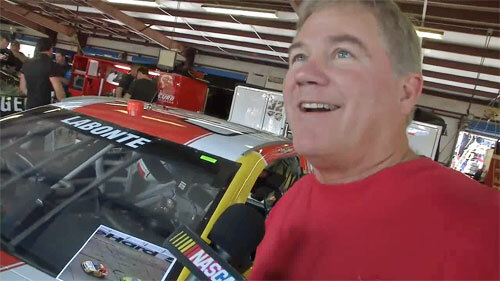 Photo shows NASCAR chanpion Terry Labonte speaking to Garage Cam host about his final race. Labonte started the race 9th on Sunday in Talladega and finished 33rd. Watch Terry Labonte speaking about his career and final race in Talladega. Labonte was introduced to the sport through his father, who had worked on race cars as a hobby for his friends. He is the older brother of 2000 Winston Cup champion Bobby Labonte, and the father of former Nationwide Series driver Justin Labonte. In 1998, he was named as one of NASCAR’s 50 Greatest Drivers. Sports Speakers 360 is a booking agent for pro athletes. If you would like to book Terry Labonte for a speaking engagement, appearance or endorsement, contact Terry Labonte’s booking agent for fees at 1.855.303.5450.